These insoles are perfect for easing foot pain if you have flat feet or high arches. Having flat feet or high arches can make you more at risk of developing excessive pronation when you walk or run. Excessive pronation can place extra strain and pressure on your feet and can cause injuries such as plantar fasciitis and Achilles tendinitis to arise. Luckily, wearing a pair of these insoles if you have flat feet or high arches can help. They use orthotic support to re-position your feet and prevent your feet from pronating excessively during the gait cycle. Not only that but the inbuilt arch support will also help to stop unnatural load from damaging your arches helping to ease arch and heel pain. 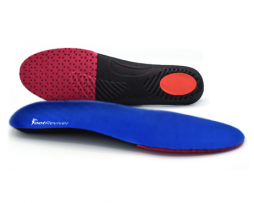 Nuova shock absorbing insoles are designed to increase the surface area of the foot helping to reduce the force generated by the impact of your foot hitting the ground and helps by absorbing much of the force through its tough but light plastic shell. You get 1 pair of Nuova Shock-absorbing insoles (1 left and 1 right insole). Better shock absorption has been shown to help treat and prevent a wide number of different foot and lower limb injuries. 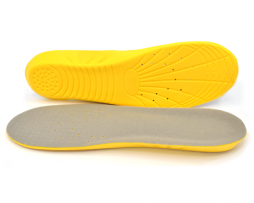 For example wearing these insoles can help with plantar fasciitis, Metatarsalgia, Achilles tendonitis, Shin Splints, Knee tendonitis as well as various hip and lower back related injuries. Active carbon-fiber design for odor protection. Breathable holes keep your feet feeling fresh and stops the build up of bacteria. Heel cup keeps your foot stabilized and prevent ankle and foot sprains from occurring. Excessive pronation when you walk is the leading causes of foot injuries such as plantar fasciitis. These insoles have been proven to help stop your foot from pronating too much when you walk helping to reduce the risk of plantar fasciitis. 30 day money back guarantee means you are never left out of pocket if you’re not 100% satisfied with your new pair of insoles. Keep your feet protected with a pair of our new and innovative foot support insoles! These insoles have been specially developed by our team of foot experts to help support your feet in the optimum position! They will help to eliminate any bio-mechanical problems that you might have affecting your feet and have been made from the very best EVA shock absorbing materials which will not only protect your feet but also your legs, knees, hips and back from excessive strain and pressure. These full length insoles have been made to support your whole foot. 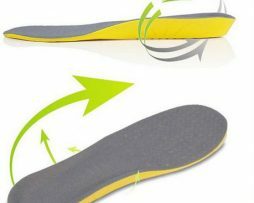 By realigning and adjusting the positioning of your foot during the gait cycle these insoles will help to improve the way that your foot functions. This will help to reduce strain and pressure on your feet when you walk and reduce your risk of foot and lower limb injuries. They have been made using light weight EVA material that will absorb shock. Inbuilt arch support will support your arches and correct common muscle and bio-mechanical imbalance linked to foot strain, pain and injury. Heel grips keep stop your feet from slipping around inside your shoes reducing your risk of developing blisters, bunions and other foot problems. Breathable holes help to keep your feet feeling fresh and odor free. Why choose these shock absorbing insoles? Designed to help treat and prevent the main causes of foot aches and pain including injuries such as plantar fasciitis, metatarsalgia, foot drop, Achilles tendonitis. All orders come complete with a full 30-day money back guarantee for customer peace of mind.